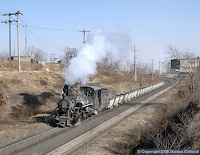 The last place you would expect to find a steam worked narrow gauge railway is Beijing, China's bustling modern capital. 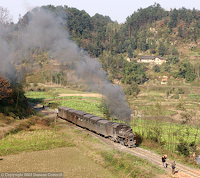 However, only a short distance from the glass and steel towers of the city, diminutive C2 class 0-8-0s shuttled back and forth, hauling trains of tubs between the quarry and the limestone plant at Dahuichang. The line closed in 2005. A vast network of 2'6" gauge lines was built to exploit the forestry resources of Manchuria but in recent years most have closed as logging operations have been scaled down. The Weihe Forestry Railway was the last to use steam traction and finally closed in March 2003. These photos were taken a couple of weeks earlier when the railway was still very busy.